Our chickens and turkeys arrive at the farm as day old chicks and turkey poults. They are given fresh water, vitamins, and natural grains, and are kept warm in the barn until they get their feathers. We then set them out to pasture where they can scratch and peck about in the green grass to their hearts’ content. All the grain that we feed is non-GMO. We are sorry that we no longer offer roasting chickens for sale. We are now raising them just for our restaurant. 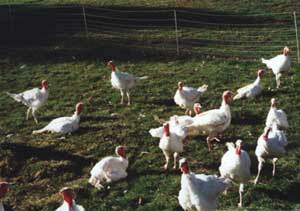 Turkeys for Thanksgiving are available either fresh or frozen by reservation only. They weigh approximately 16 to 23 lbs. and come complete with necks, hearts, and livers. They are processed on the farm and will be available for pick up at the farm Tuesday, November 20th between 10 a.m. and 2 p.m. or by appointment. We begin taking reservations for turkeys on September 1st. Please contact us to reserve a fresh or frozen turkey or for more information.